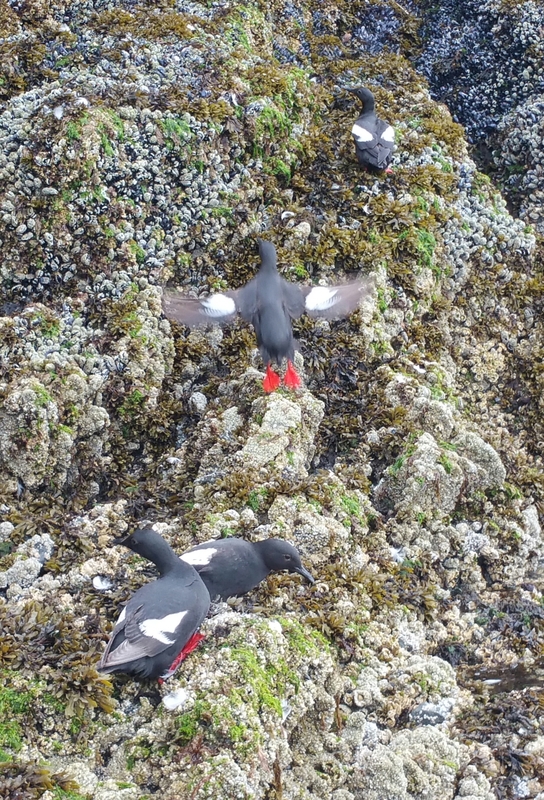 A funny little bird with bright red feet – I actually got this cool photo with my cell phone from the boat. It’s the Guillimot. When was the last time I blogged? I don’t even know, but I think its been a couple of weeks. I felt like I was doing good – sometimes blogging every day, and usually five times a week, but then, I know – I went off the radar. For those of you that read regularly and look forward to it – I apologize. I’ve been guiding on the ocean almost every day. Sometimes, it’s back to back trips as days are long here. Family has been here, and when I wasn’t guiding, I was entertaining them. In the midst of that, any free time was spent trying to keep the lawn mowed, miscellaneous chores, being a husband, and oh yes, lots and lots of fish cleaning, fish smoking, fish vacuum packing and freezing, etc. Yes – it’s the season of plenty, and anyone that wants to go fishing is virtually assured of getting their limit of red salmon right now. It’s also the season of plenty at the bed and breakfast – where our 7 units have been full up almost every day. 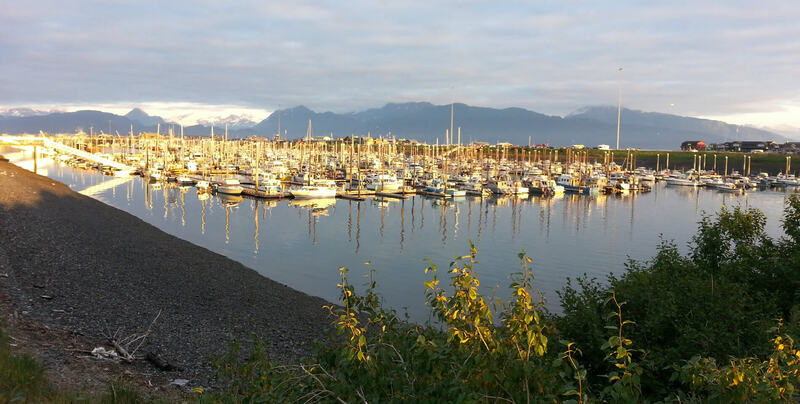 We are grateful for the good business, and all the kind, interesting people who are thrilled to be in Alaska. The Melvin Crafton party were particularly memorable – a father and mother – who I called “Daddy” and “Momma” with a southern twang, because that’s what their kids called them, and thats where they were from (Tennessee). 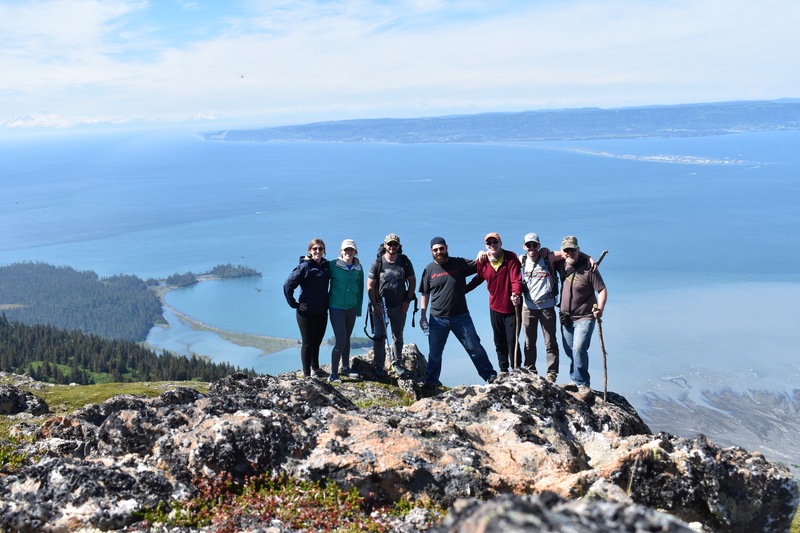 We spent a full day in the boat, and went from east to west, exploring and photographing from the Glacial Spit to Halibut Cove to Gull Island, and winding up in Little Tutka Lagoon where we slew the salmon. I had much in common with Melvin’s daughter, who is a biology teacher, and was thrilled with the wildlife and scenery, which she photographed to share with her students. I look forward to receiving good pictures from Laura. The Karen Smith party was fun. Karen told me that she and her husband were the fisher people, and her daughter and sister were not as interested and “I don’t know how long they will stay last.” Well, they were tenacious, all of them, until we got their limit – which took a few hours. The boat looked like some carnage happened at the end. The day was complete for me with plenty of trash talking, laughter and thrills. Then Robert Veith showed up, with his friends from Australia. Vanessa and Phoebe were fun and interesting, because every single thing they saw was all brand new – and they were so excited about it. 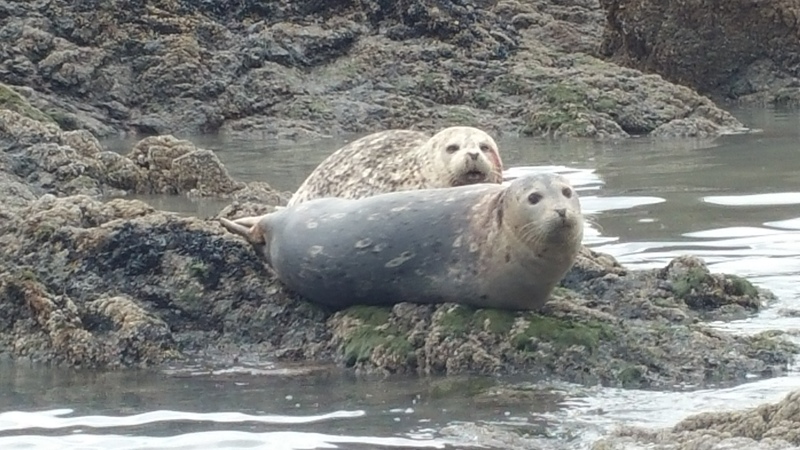 Sea otters, puffins, harbor seals, and the myriad of other wildlife were all thrilling for them, as was catching their first fish! Jim Novak came with a party of five – some of which are from Minnesota, and of course, are fisher people. They caught on to “Alaska Style Snagging” quickly, and I think everyone felt right at home together. Becky and John did a “father/daughter trip”, all the way from Arkansas. Becky took her 75 year-old father on a trip of a lifetime to Alaska; I think that’s really cool. 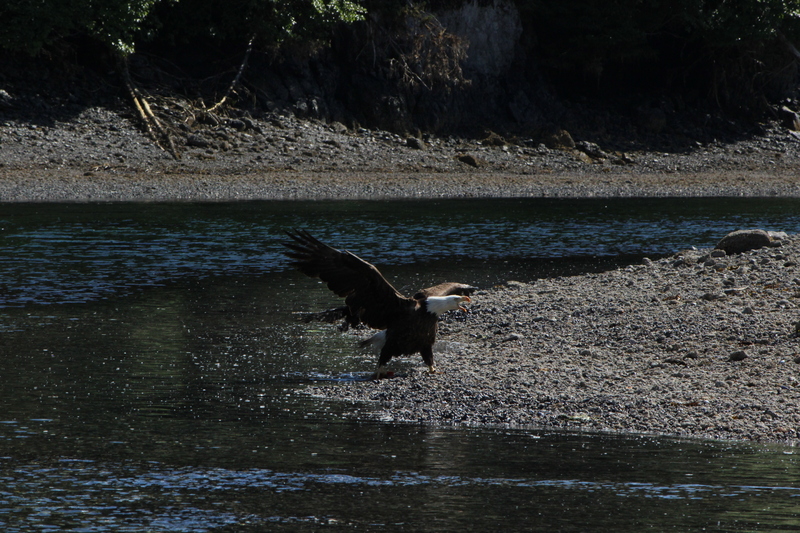 Becky got some really good photos, and John had fun wrestling with his first salmon. Wynn and Jose Richards and I also had a lot in common. They were both photographers back in the day, one, a wedding photographer, the other, a commercial photographer. They actually met in a photo lab 30 years ago – so we had fun talking about the old days with film, transparency, medium format, the stressors of being a photographer and owning a photo lab, etc. The striking thing about Wynn and Jose was that they had a permanent smile etched on their face for their whole trip. Back to today: The high tide has swung to the evening, so I have a trip scheduled for later today. It gives me a little time this morning to catch up on emails and writing, drink lots of coffee, and having breakfast with the guests. I have good intentions to blog tomorrow, but I really don’t know for sure when I will be back! I gotta have the mental and emotional energy to do this and it is best done in the am. For now, enjoy a few of these pictures from the trips I described above, and be assured that I will share more as they roll in. 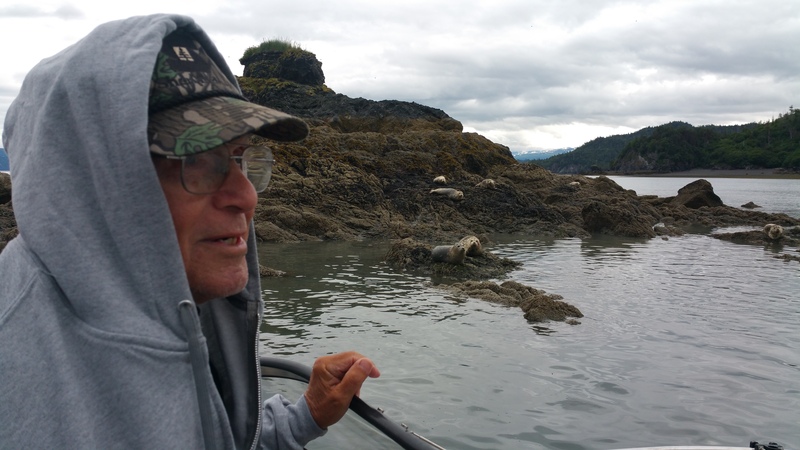 “Arkansas John” enjoys the Harbor Seals somewhere in Kachemak Bay. A couple relaxes and enjoys a glass of wine on our deck after a day of fun. 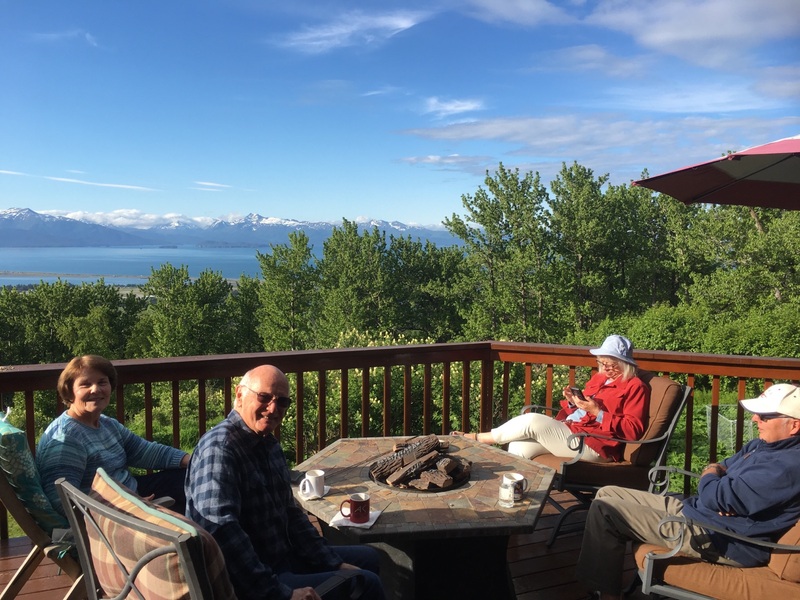 Two couples enjoy a sunny morning on the deck after breakfast. 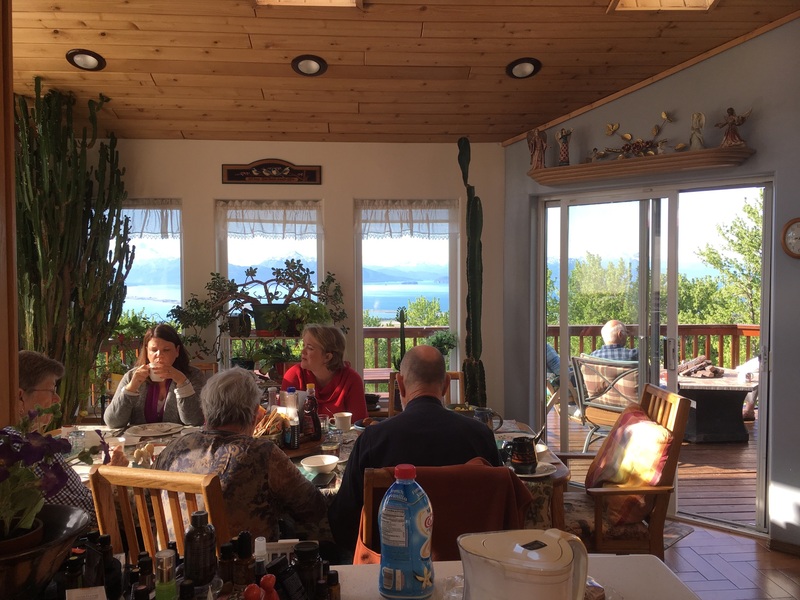 A typical morning around the breakfast table – from Maria’s perspective. Is this round two or round three? Sometimes she feeds over 20 people! 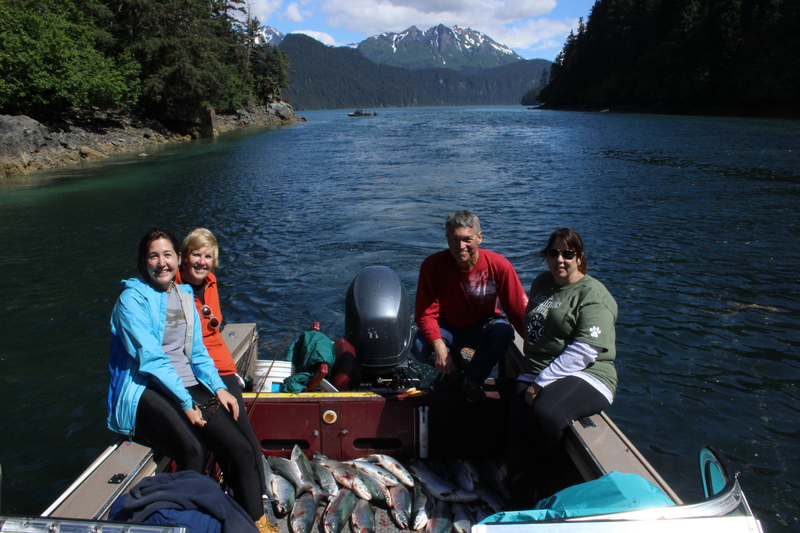 The Smith family with a “hogger photo”; there are 24 beautiful red salmon at their feet – which they will enjoy eating at their home for many months. 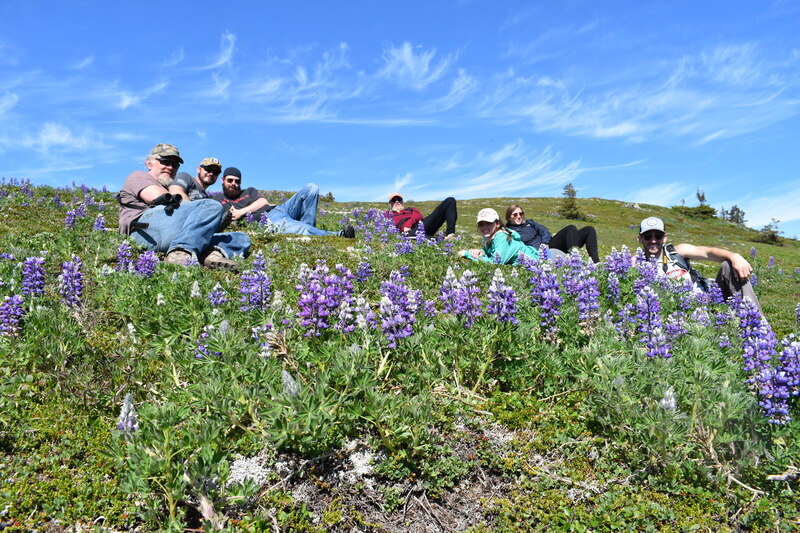 My family lounges amongst lupines atop Sadie Knob after a grueling hike. I am happy to say that I can still hang with the young whipper-snappers! 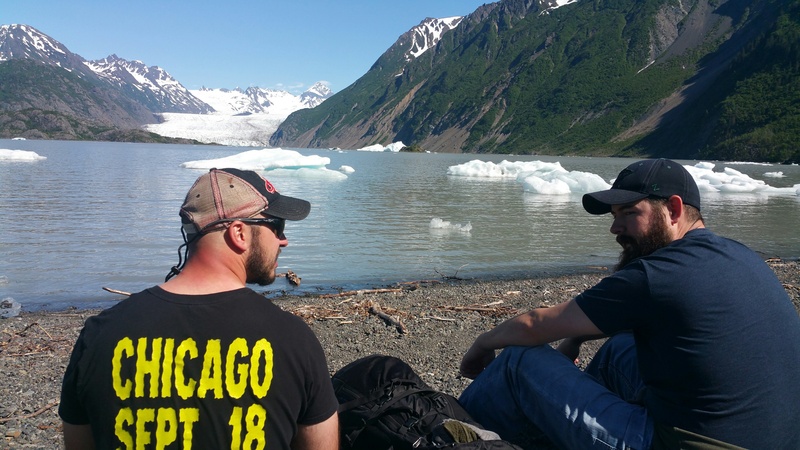 Having hiked the Saddle Trail, Ben and Shon hang out at the the lake below Grenwingk Glacier. FISH ON! 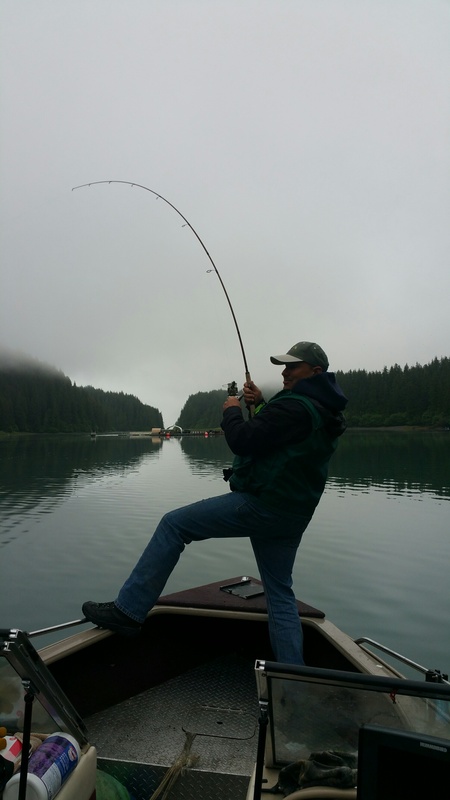 Tutka lagoon – catching red salmon on a foggy morning. My family enjoys their reward atop Sadie Knob. Wow – the view! Homer and The Spit is in the background. 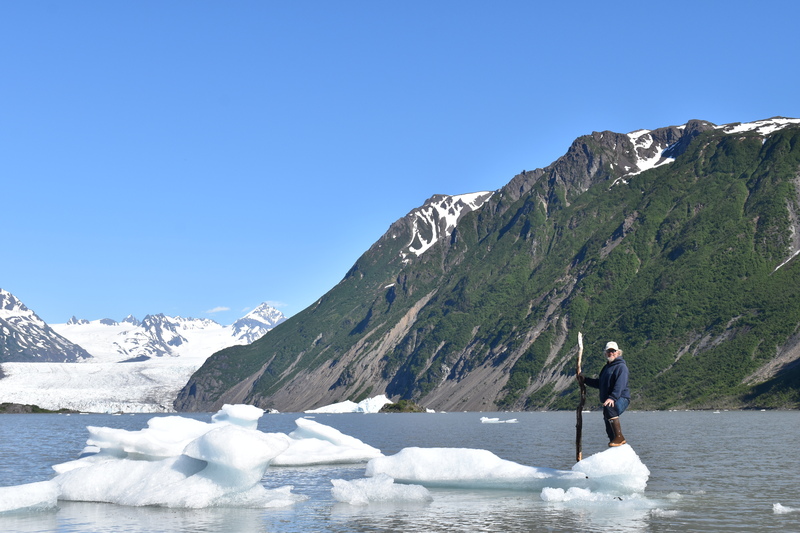 Always the one for adventure, and a good picture – I waded out and climbed onto an iceberg below Grenwingk Glacier. Strike the pose! Thank you, Tim, to one of the best days ever!! You have such a gift for making everyone feel comfortable, warm and welcome. Our salmon arrived at our home today in Vero Beach. . . and guess what’s for dinner tonight!? 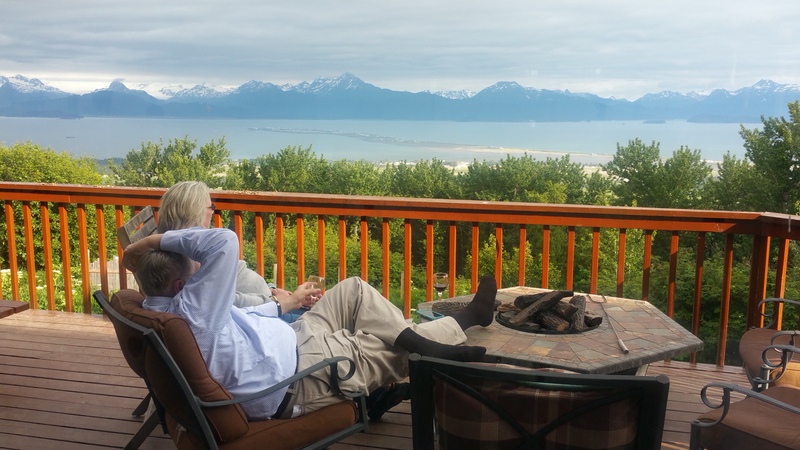 We cannot wait to get back to Homer and stay much longer. You will be our first call! Really nice photos!! Love the Sadie Knob one! !